When looking at cannabis seed options online, there are "photoperiod" and "auto-flowering" strains available. Republished with permission, orginal article here. Usually will produce a usable yield in a longer amount of time. Will produce a more potent bud. Responds well to topping and super cropping in the vegetative cycle. Will vegetate for a limited amount of time before automatically going into flowering mode (each strain's vegetative time will be different). Usually will produce usable yield sooner. Will produce a smaller plant and therefore limited yield. Will produce less potent buds. Can't take much abuse due to limited growth time. May not respond well to topping and super-cropping. Can be stressed and hermie (grow both male and female parts) as a result of incorrect light cycle changes. Need the same amount of nutrient care. Photoperiod cannabis is the 'industry' standard; it is the natural state of THC-potent cannabis strains. If planted outside, growing photoperiod cannabis is only viable "naturally" when planted at the beginning of the summer, naturally entering flowering mode at the end of the summer when the days become shorter. Note by Nebula: In some instances, photoperiod strains of cannabis may be easier to grow indoors if you are a new grower because you can give yourself as much time as you need in the vegetative stage. During this stage, cannabis plants are hardy and can bounce back from problems. Even if you make a lot of mistakes, you can still get big yields because you are in control of when the flowering stage begins, unlike with autoflowering strains. 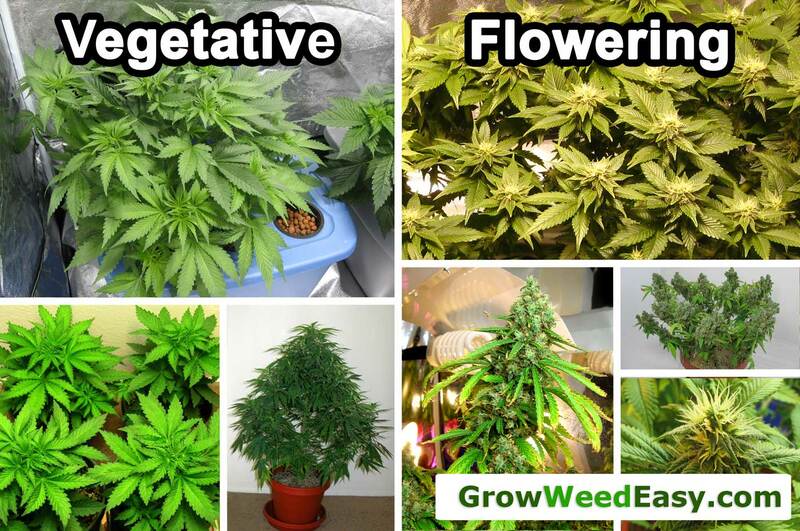 Once the flowering cycle is initiated, your plants are more "set" as far as their overall health and structure. Once a cannabis plant starts budding, there is basically a countdown until buds are ready to harvest (this amount of time is mostly based on the strain). Though the plant may have an initial last "stretch" of vegetative growth when the light cycle is first changed over, as the plant approaches harvest towards the end of the flowering stage, almost all growth halts except the development of bigger buds. This key breaks down some of the terms used in the article below such as "24/0" or 12/12"
The automatic flowering nature of ruderalis creates a smaller plant, as its vegetative cycle is naturally limited, whereas a photoperiod strain can be vegetated into a much larger plant before switching to a flowering light cycle. Note by Nebula: The auto-flowering plant pictured to the left is 2 months from seed and has been well-cared for. 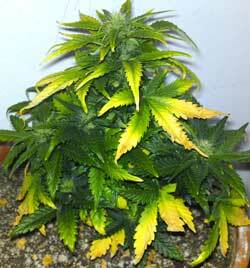 This plant naturally stayed short and bushy and displays the classical growth pattern of most auto-flowering strains. This plant still has a few weeks before time-to-harvest, and buds will continue to fatten up. Note by Nebula: The auto-flowering White Widow plant pictured to the right is sick and stunted. Because of the auto-flowering nature of this strain, the grower was unable to nurture the plant back to health before the flowering stage began. In this picture, the plant is 2.5 months old (started from seed like all autoflowering plants), and the buds are almost ready for harvest even though they're still small and airy. As a result, the total yields from this plant will be very low (just a few grams). This can be discouraging as the grower must start over with a new seed in order to try for a bigger harvest. The clone and mother will still flower at the same amount of time after the original seed they both came from was germinated. Given that autoflowering strains have a very short vegetation cycle, it is debatable whether or not you'd gain a larger yield from making a lot of small flowered clones from one auto or if you let the auto vegetate and flower into one large plant. Along the same lines, the limited vegetative cycle does not allow for very much drastic growth techniques like topping and super cropping, as the plant doesn't have a lot of time to recover from these before it flowers. Sturdy strain is easy to grow and a good choice for first-time indoor growers. Performs very well indoors, naturally stays short/bushy, low odor, and potent buds just like the famous Northern Lights strain. Great option for outdoor growers with very short summers as she's ready to harvest just 2-3 months after sprouting from seed . One of the original auto-flowering strains, with decent yields and a good buzz. Neutral odor while growing that is reminiscent of hay or flowers, and tropical fruity smell/taste after being harvested and cured. Given the right conditions (happy plants, cooler temps at night as you approach harvest), this strain often shows hints of blue or purple in the buds/flowers. Plants tend to grow a bit bigger than other autos and this strain usually needs a full 3 months of growth before being ready to harvest. See Nirvana Northern Lights + in Action! 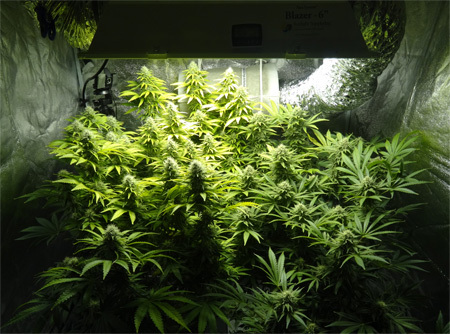 This plant is much larger than most auto-flowering plants, but shows what can be possible when auto-flowering plants are well taken care of throughout their life.